Thousands of Hollywoods biggest blockbusters and hit television shows use Fusion to create their groundbreaking visual effects. 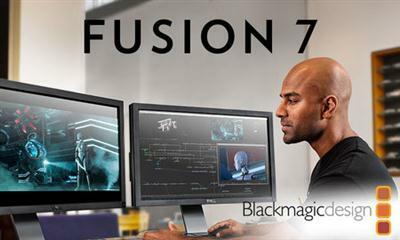 Fusion has been used on feature films like Thor, The Amazing Spiderman 2, and The Hunger Games, as well as hit television shows like Orphan Black, Breaking Bad, Grimm, Adventure Time, Downton Abbey and the Emmy award winning Battlestar Galactica. Fusion uses nodes which are small icons that represent effects, filters and other processing which can be connected together to easily build up larger and more complex visual effects. Because nodes are easy to see and connect together, you can combine tools, images, and objects in any order to create unlimited visual effects. Nodes make it easy to adjust any single part of your project simply by clicking on the node and making an adjustment. That much faster than a timeline based tool such as an NLE because you do not need to hunt through nested stacks of confusing layers. Whether you need to pull a key, track objects, retouch images, animate titles, or create amazing particle effects, Fusion has a massive toolset that lets you tackle the most demanding visual effects and motion graphics jobs. You get the worlds best 3D workspace along with tools for compositing, keying, painting, animation, stereoscopic 3D and more, all in a single application! Fusion is an extremely fast visual effects software tool that responsive enough to be used in high pressure, client driven sessions. With its GPU acceleration, you get instant feedback while you work so you can see exactly what you are doing. Whether you are working alone or with a client, Fusion gives you the real time control you need so you can spend more time being creative and less time waiting. Fusion has the worlds fastest production quality render engine! You can distribute your render jobs across an unlimited number of networked computers for incredible performance! That means you can render complex scenes incredibly fast to meet the intense deadlines of production, without having to sacrifice creativity or quality. When you are working with a large creative team, Fusion Studio also includes Generation, multi user management software. Generation is an amazing collaboration tool that helps you manage and track versions of every shot in your studio. You can assign tasks to artists, make notes, and see each team members workload to help balance the work and finish projects faster. Fusion Studio also features a bin server to let everyone share and see common assets that are needed for the job. That means you do not have to copy and track multiple elements on different computers. Create advanced motion graphics with incredible depth using Fusions infinite 3D workspace to seamlessly combine vector graphics, live action and 3D objects! Fusion Studio includes the worlds most advanced camera matching, stereo alignment, convergence and spatialization tools for creating realistic, eye popping stereo 3D! You get everything in Fusion 8 plus advanced optical flow image analysis tools for stereoscopic 3D work, retiming and stabilization. Fusion Studio also includes support for third-party OpenFX plugins, unlimited distributed network rendering, and Generation for studio wide multi user collaboration to track, manage, review and approve shots when working with large creative teams on complex projects.